We’ve put together a collection of our favorite, high-quality Photoshop and Illustrator brushes, to help you put the perfect finishing touch on your next design. 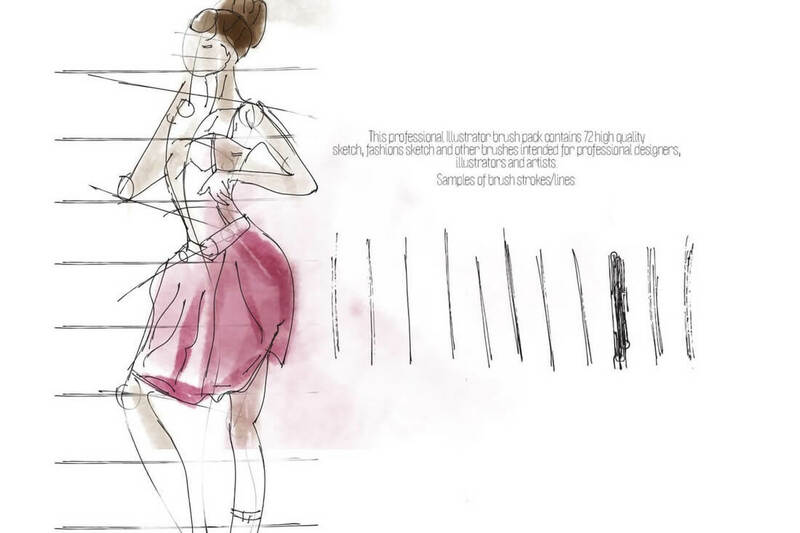 A Photoshop or Illustrator brush is, at its simplest, exactly what you’d expect — a way to draw a particular line or style in a Photoshop or Illustrator document. Click, drag, and paint like you’re using a brush! But in practice, brushes can be used for so much more. From textures and patterns to lighting and stylish effects, the versatility shown in these examples will give a great idea of what’s possible with a top-notch brush pack! 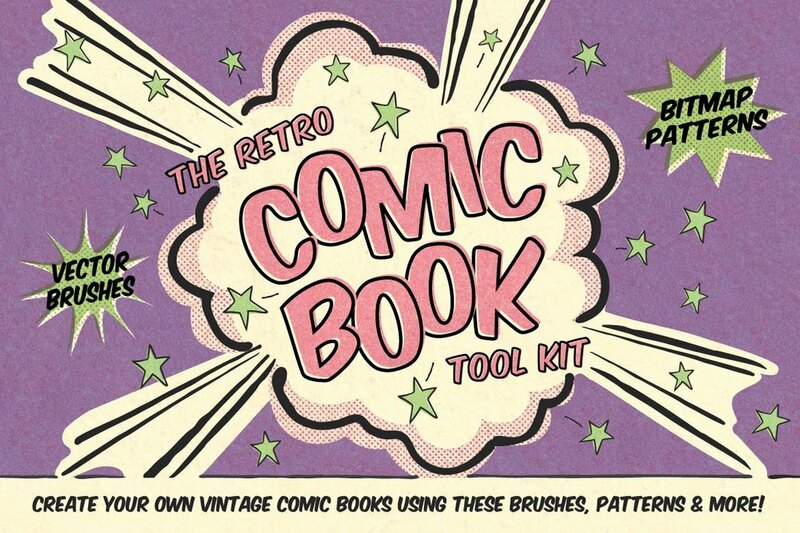 This pack of Illustrator brushes is made specifically for artists and illustrators who draw in retro and comic themes. The bundle includes 84 unique vintage brushes for drawing authentic retro artworks. It also comes with 4 Bitmap patterns, 2 grunge edge overlays, and a set of comic book layer styles. A collection of unique watercolor brushes for Illustrator. It includes a set of unique brushes that give your drawings a natural flowing look. The pack also includes a set of brushes with pressure sensitivity for tablets. 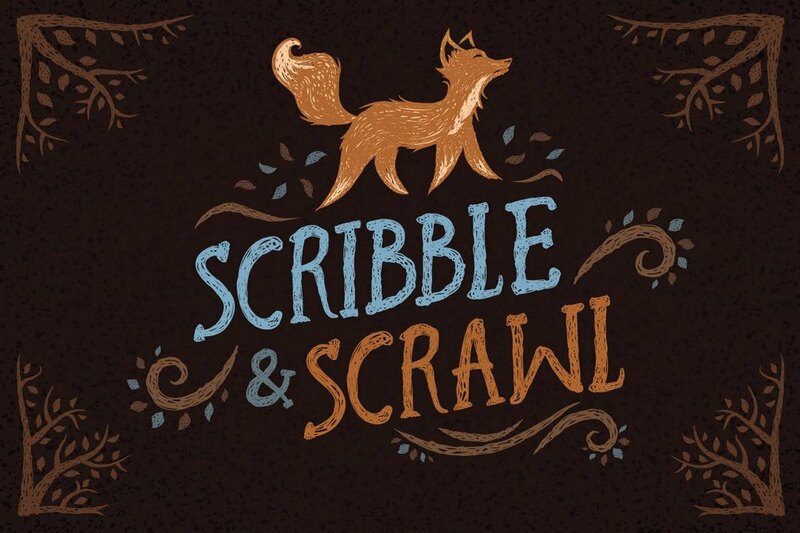 Just as the name suggests, this bundle of Illustrator brushes is made for scribbling and scrawling. 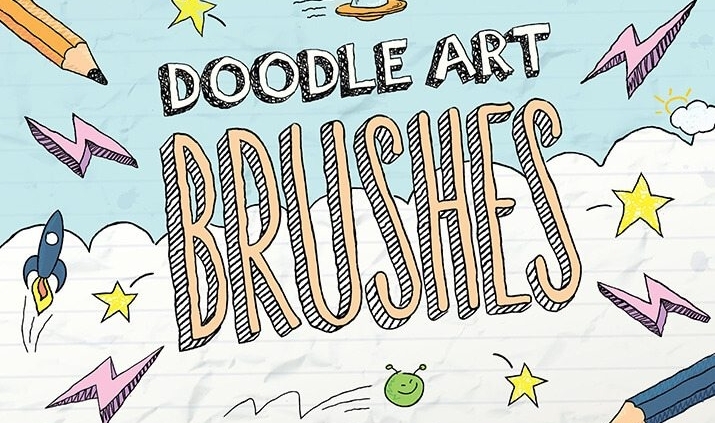 It comes with a set of brushes that gives a quirky look to your drawings and make them look as they were drawn by a child. 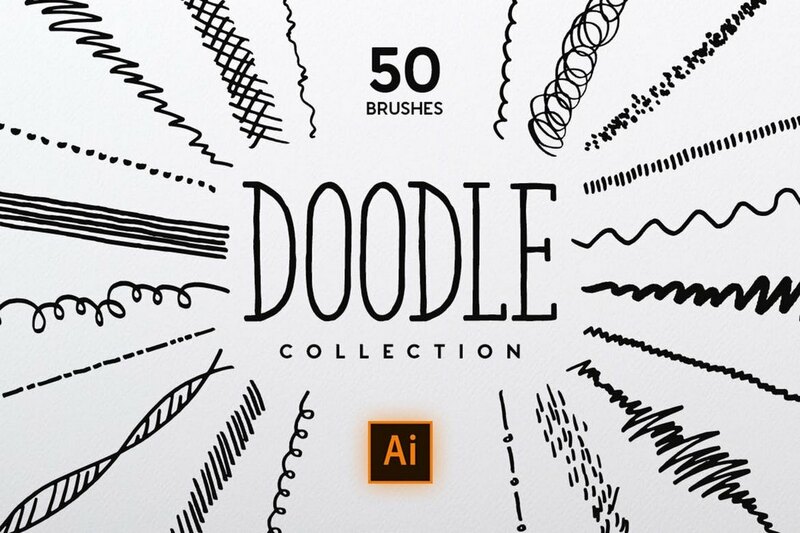 A massive bundle of 50 different brushes for all your doodling needs. This pack includes all types of doodling brushes you can use with your various illustration needs. All of the brushes in this pack are made with real pen and pencil scans. This pack of Illustrator brushes includes nothing but arrows. 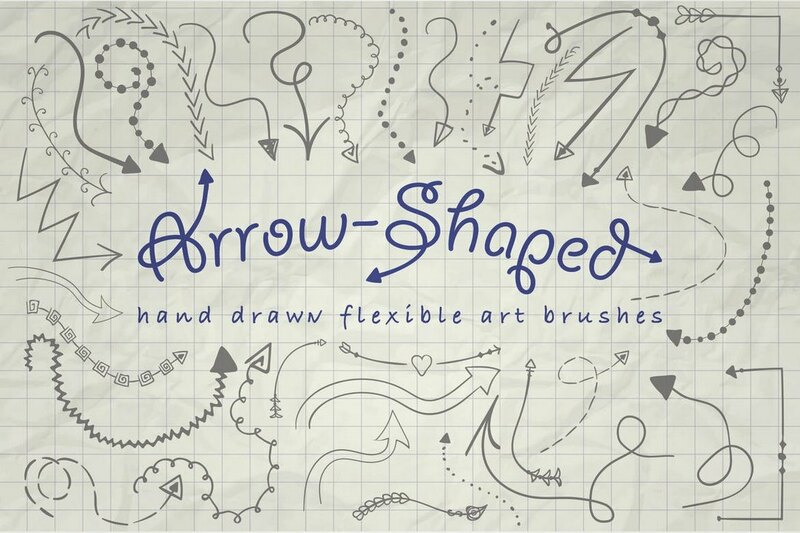 It includes a total of 39 brushes featuring different styles of arrow shapes and designs. You can easily resize and add colors to these arrow brushes as well. 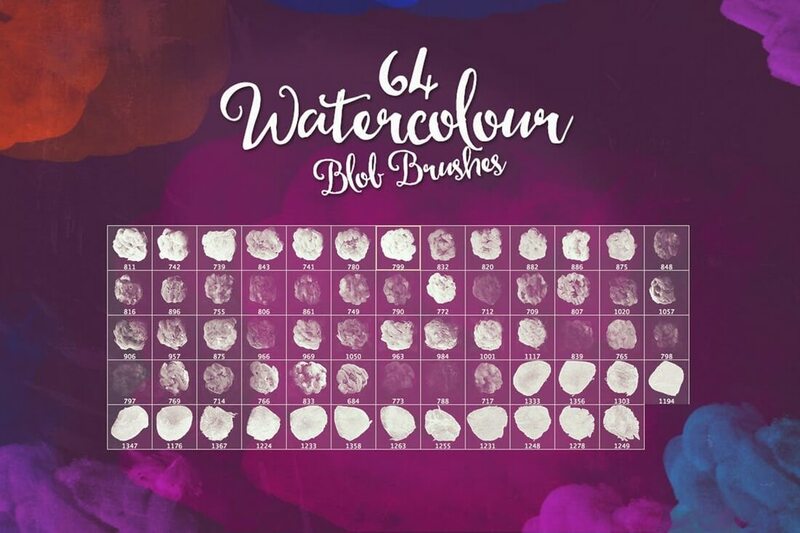 A set of professionally designed watercolor brushes for Photoshop. This bundle comes with 30 unique brushes you can use to design beautiful greeting cards, posters, business cards, and much more. 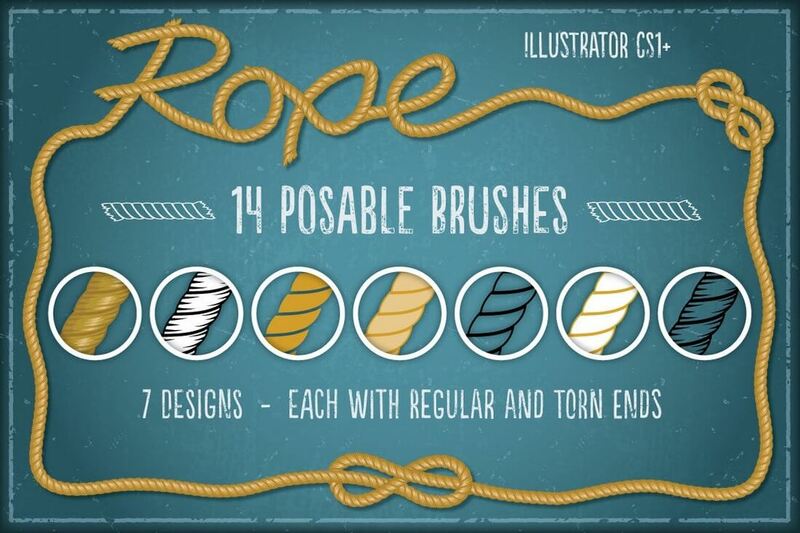 This is a set of Illustrator brushes that features rope-like designs. You can use these to create stylish borders and illustrations. 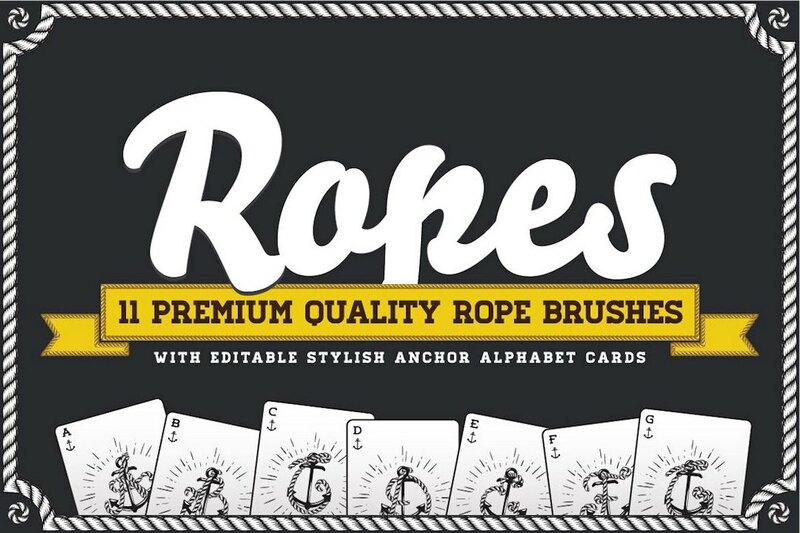 It also comes with an Alphabet featuring rope style designs for letters as well. 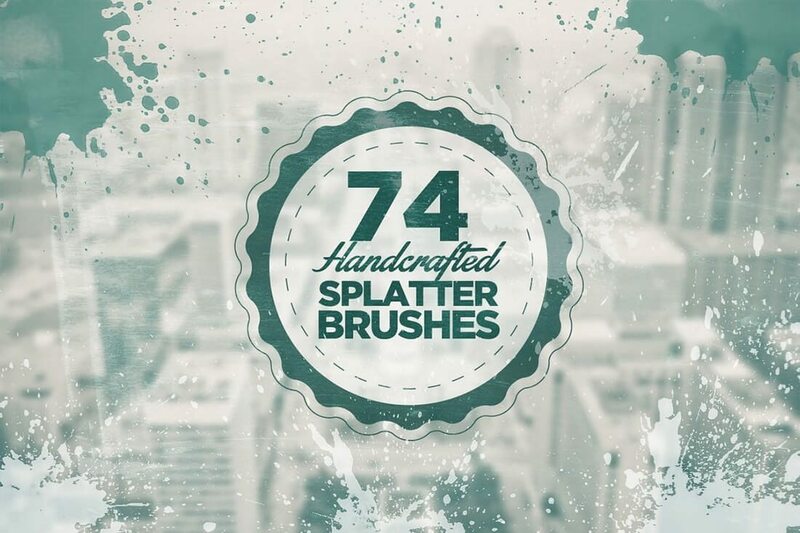 This pack of splatter brushes for Photoshop comes with 22 unique brushes you can use with your various graphic designs. 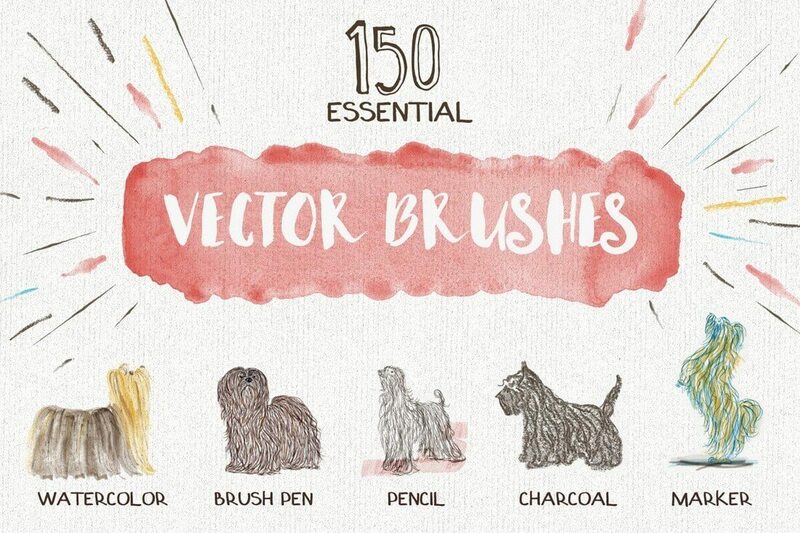 The brushes feature unique and realistic designs and come with vector files as well. 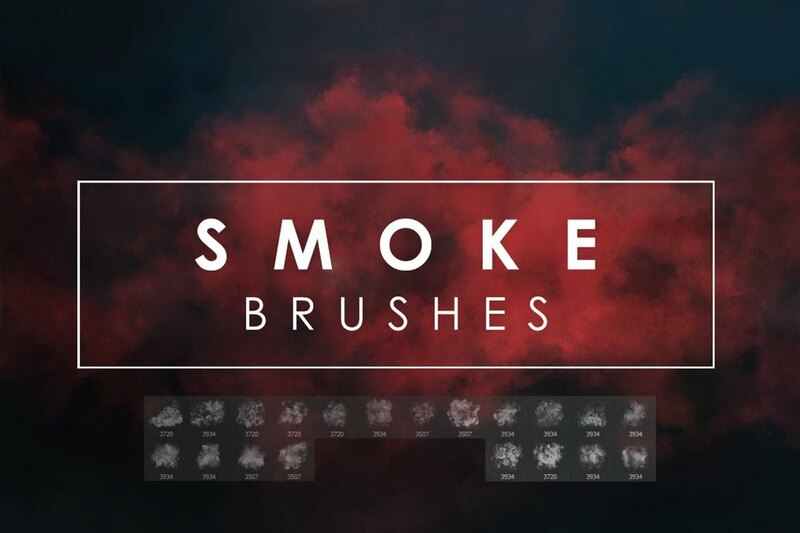 Design unique smoke effects for your graphics, wallpapers, posters, and flyer designs using this pack of smoke brushes. It comes with 20 unique and customizable brush designs. 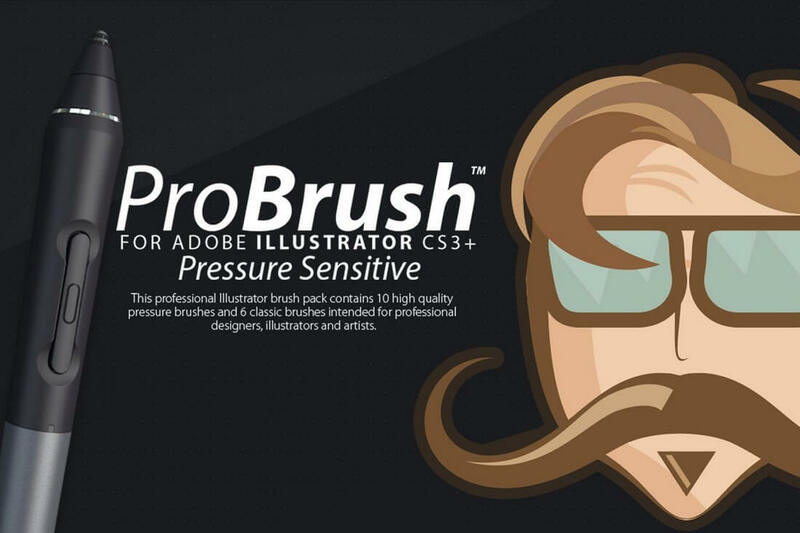 A bundle of professional acrylic and gouache brushes for Photoshop. This pack features various brushes with dry, wet, thick, dense, quick stroke designs. The brushes in the pack are also touch sensitive and they’ll work well with tablets as well. 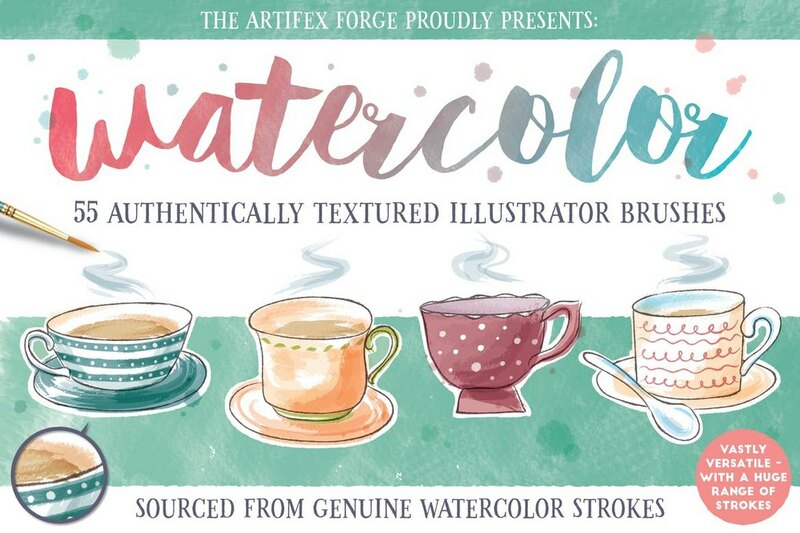 This is a collection of high-quality watercolor style brushes for Illustrator. Each brush in this pack is handmade and comes in different styles, including watercolor dry brushes, strokes, realistic brushes, and more. 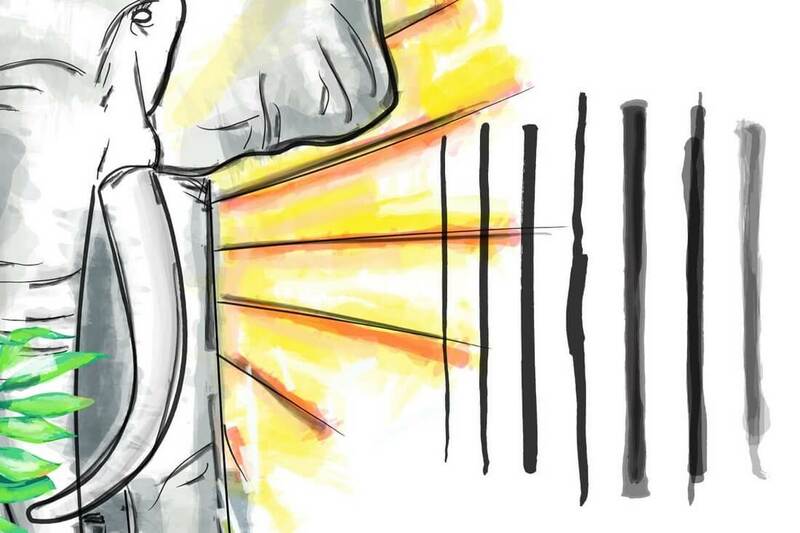 The perfect brush pack for digital sketch artists. This Sketch brush pack includes 72 handmade brushes in various designs, along with a set of sketch patterns. 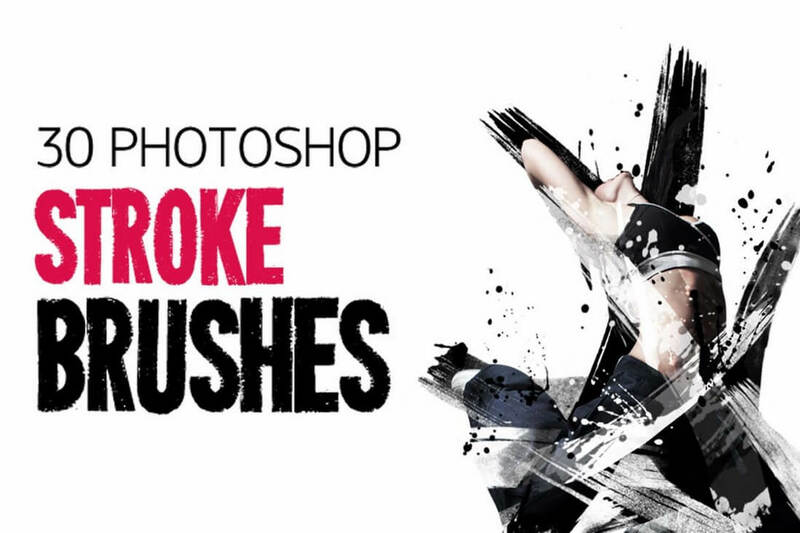 This pack comes with 30 unique Photoshop stroke brushes. You can use these brushes for decorating your graphic designs, creating textures, patterns and much more. A set of Photoshop brushes with grunge designs. It’s ideal for adding a vintage or a worn out old look to your designs. The brush pack features 20 brushes, a mockup file, and the original image scans that were used to design the brushes. 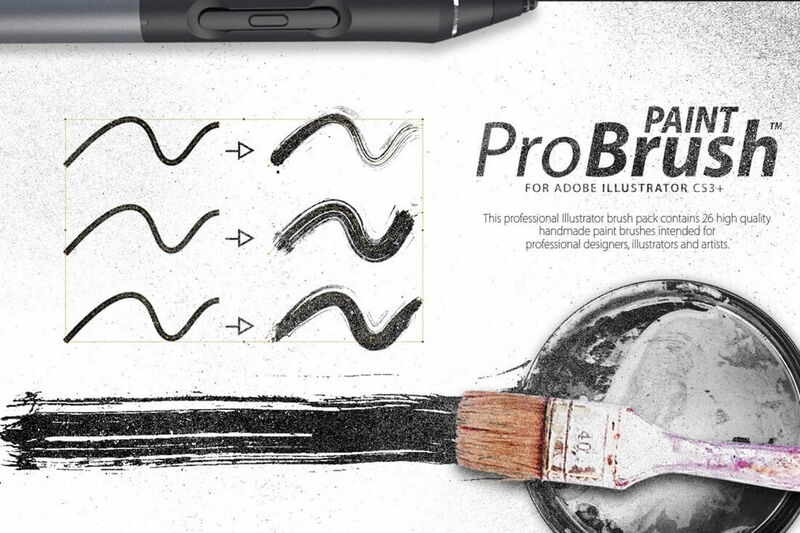 The professional brushes in this Illustrator brush pack mimic the strokes of a paint brush in its designs. 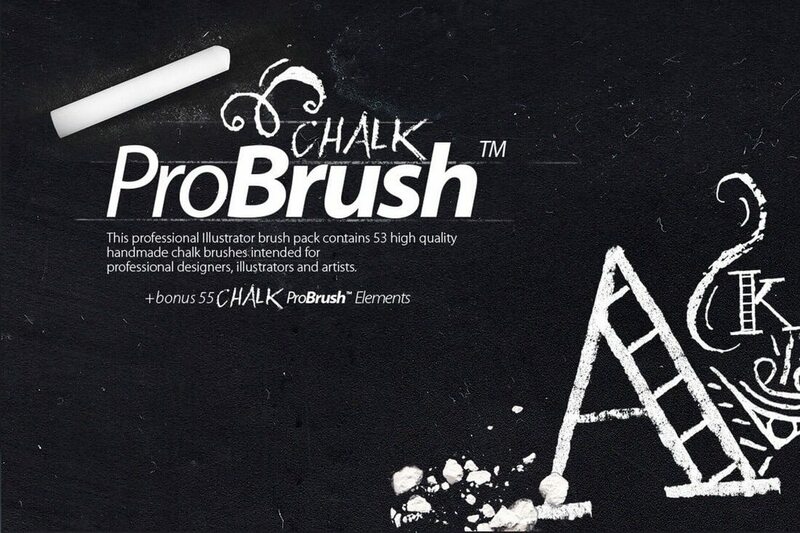 The pack includes 26 high-quality handmade brushes for creating various designs. 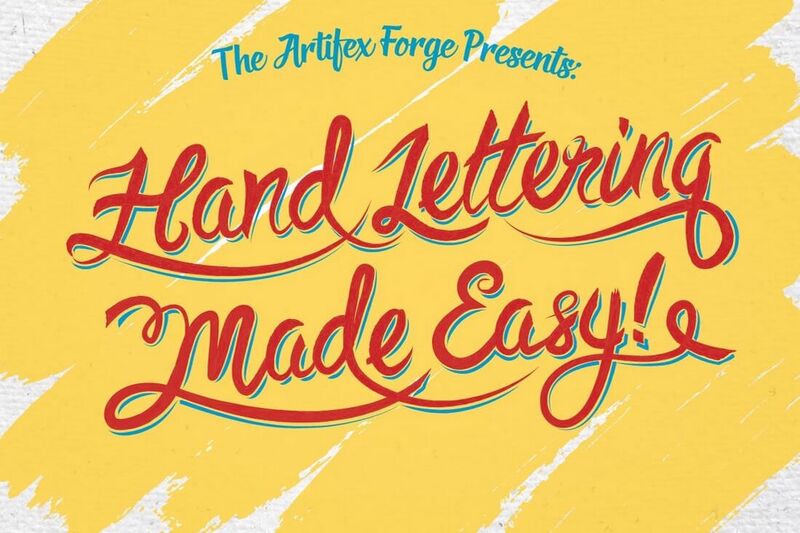 This pack includes 74 high-quality brushes that can be used for creating unique hand lettering designs of your own. It comes with brushes with various strokes, lengths, and thickness for crafting unique designs. A set of unique hand-painted brushes for creating unique designs in Illustrator. These are perfect for banners, paint swipes, text highlighting, adding rough edges, and much more. These brushes are perfect for your texture, pattern, and decoration designs. 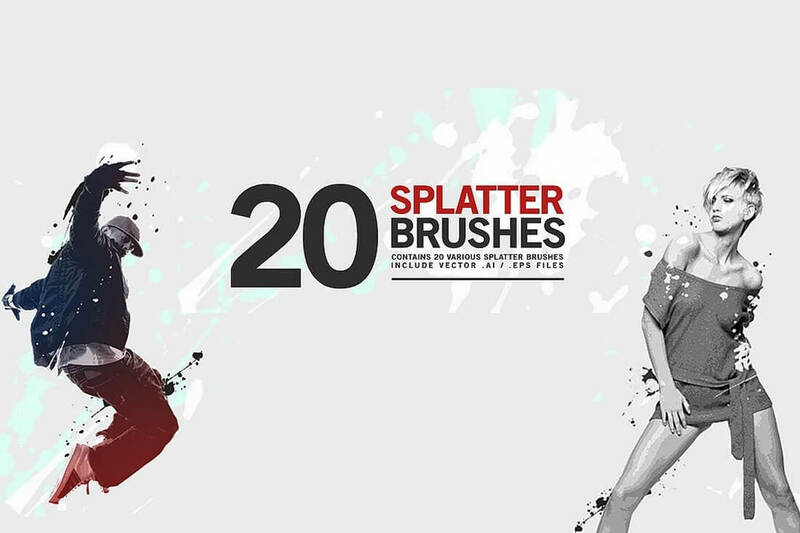 The 20 splatter brushes in this pack also come with their vector files, if you feel like customizing them on your own. 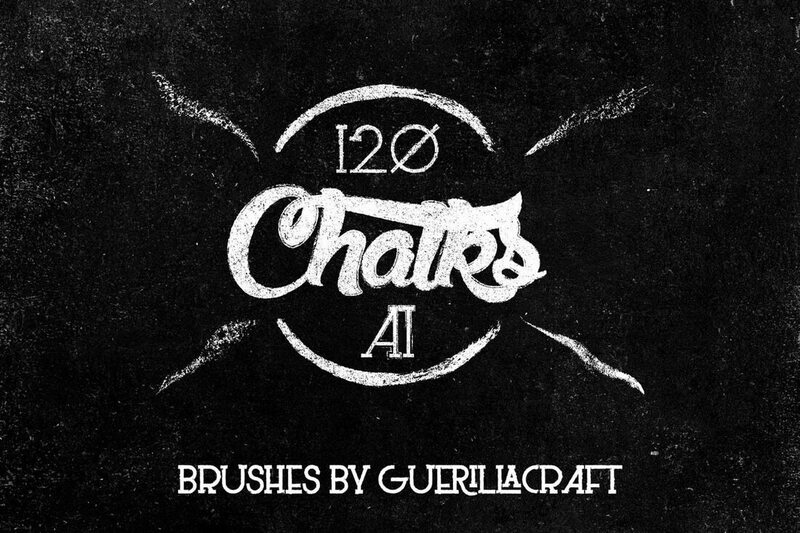 This is a massive collection of 120 chalk and charcoal brushes, all of which are perfect for illustrators and artists. Especially for drawing chalkboard illustrations. A pack of digital, ink, brush, and Asian calligraphy brushes for creating your designs with a touch of Asian inspiration. The brushes are ideal for everything from hand lettering to creating patterns and more. 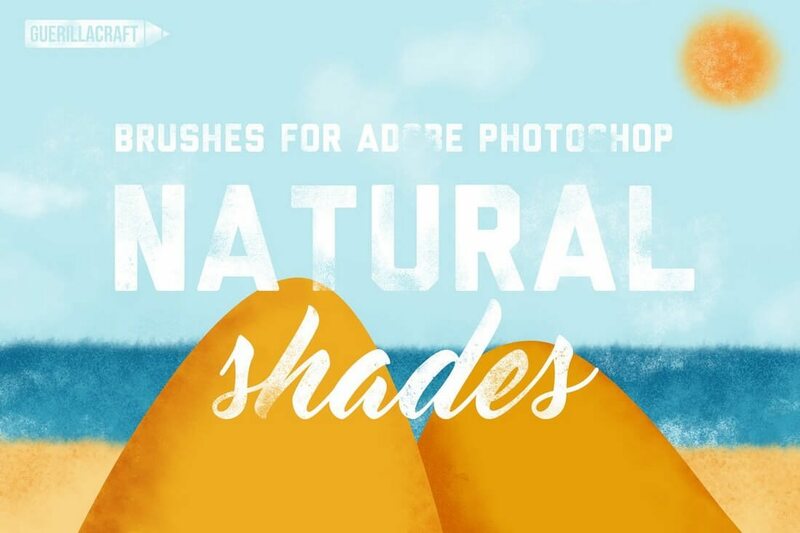 The natural and pressure sensitive shades brushes in this pack are ideal for every illustrator and designer for adding shades, textures, and even adding a handmade look to your designs. It comes with 40 resizable brushes. 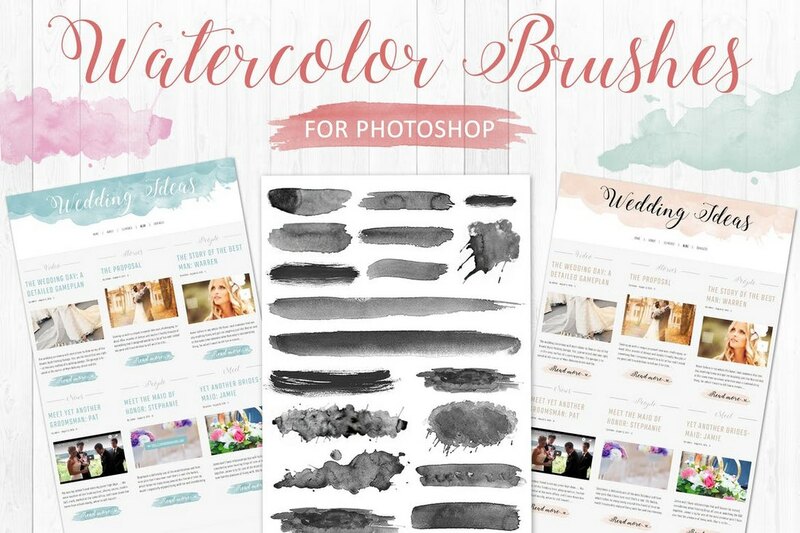 This massive bundle of brushes features 150 brushes in many different types, including watercolor brushes, pencil, charcoal, and much more. The perfect collection for artists and illustrators. 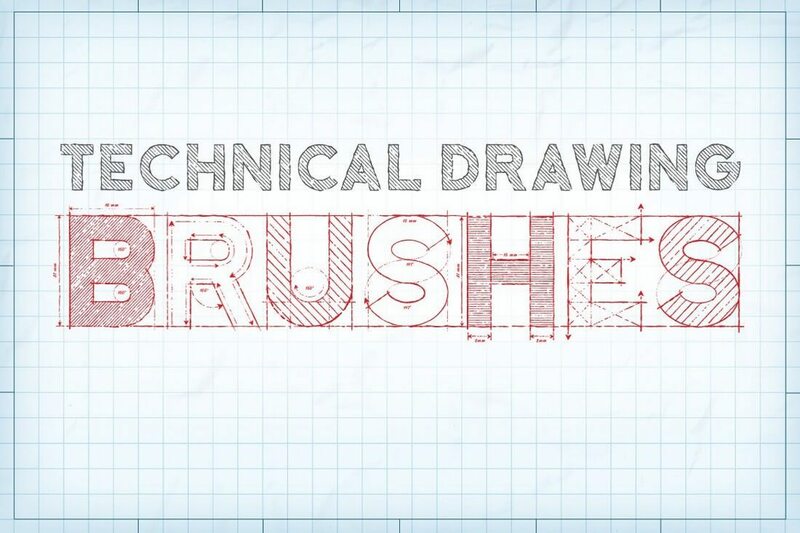 A set of brushes you can use for different types of technical drawings and sketches, like blueprints, maps, and architectural drawings. The bundle includes over 50 unique brushes and 5 bonus patterns. 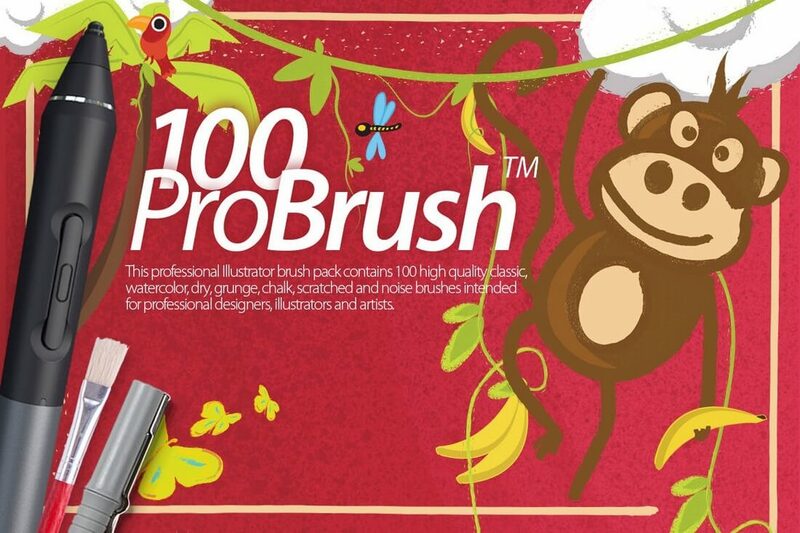 This pack contains 10 brushes for professional artists and illustrators. These brushes are also pressure sensitive, which means they will work well with your drawing pads. A handmade brush pack that’s been made using Acrylic Ink on Paper. 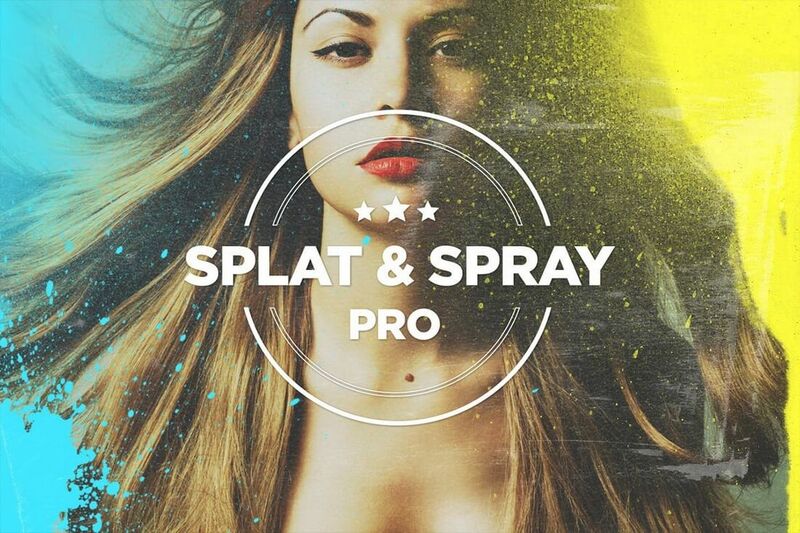 It features over 70 unique splatter brushes for adding decorations to your designs, creating textures, and more. An amazingly beautiful and high-quality set of brushes that can be used to add overlay effects to your digital artworks and designs. It includes 64 different watercolor blob brushes between 850 – 1200px resolution. 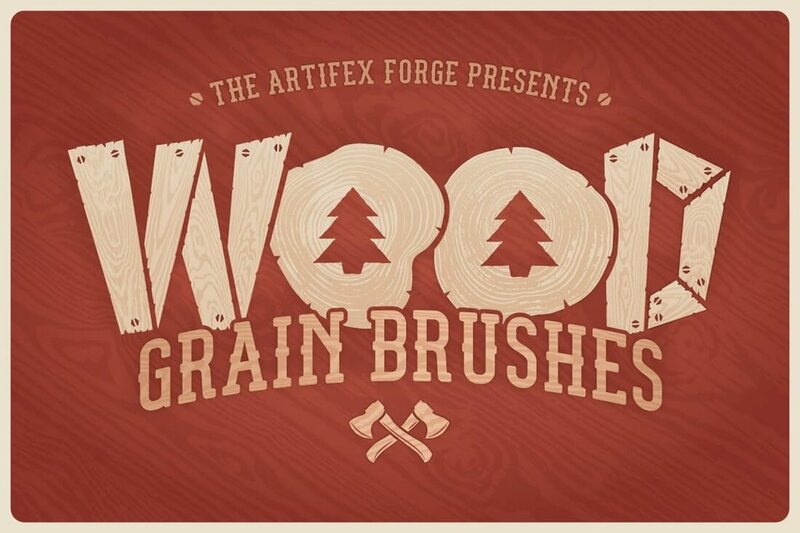 Created by live-tracing photos of real wood, these wood grain brushes are simply perfect for adding texture and depth to your illustrations and designs. It comes with 13 wood art brushes and 5 wood cross-section scatter brushes. Pastels are not just for kids. Even grown up designers and illustrators love them. Especially when it comes to designing comics and grunge style illustrations. 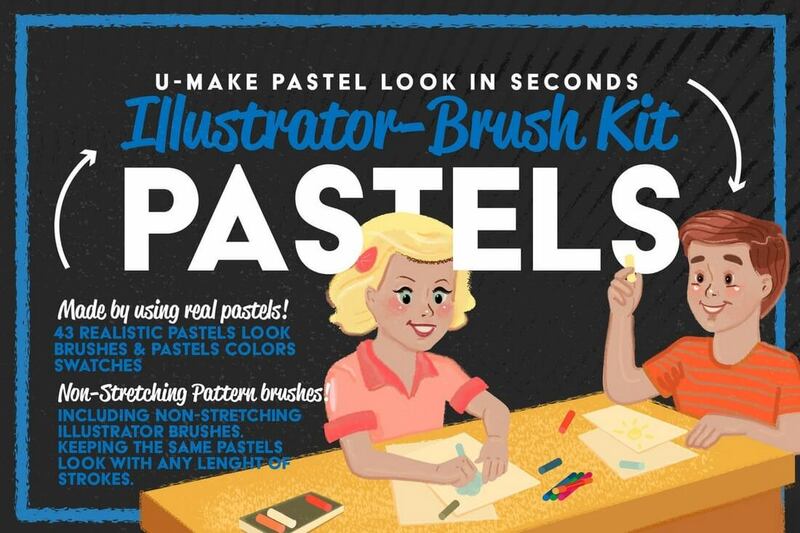 This pack of 43 pastel brushes is made just for them. Decorate your nautical and industrial designs using this set of beautiful brushes. It includes 14 brushes in 7 unique designs, each with regular and torn ended designs. This two-in-one bundle of brushes and vectors feature 59 chalk brushes, 2 chalkboard textures, and 50 more chalkboard elements, everything you need to design a cool chalkboard illustration or an artwork. 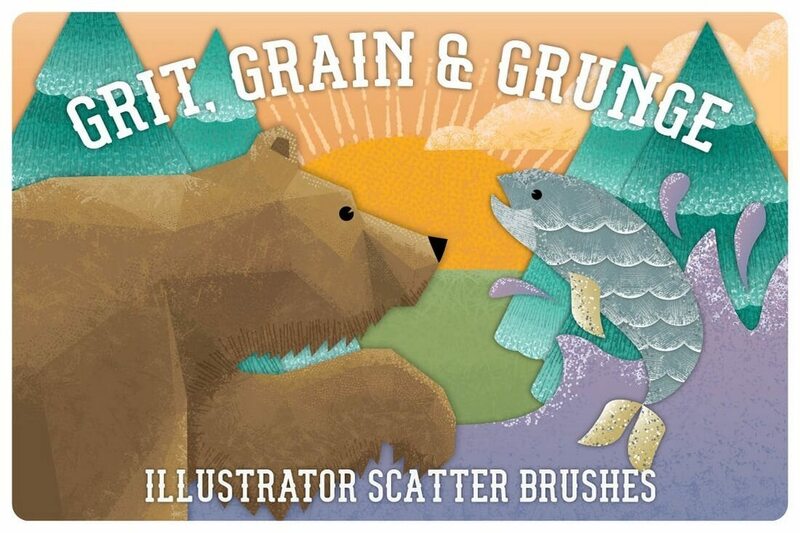 The brushes in this pack feature a woodcut/linocut like designs for adding a unique touch to your illustrations and designs. 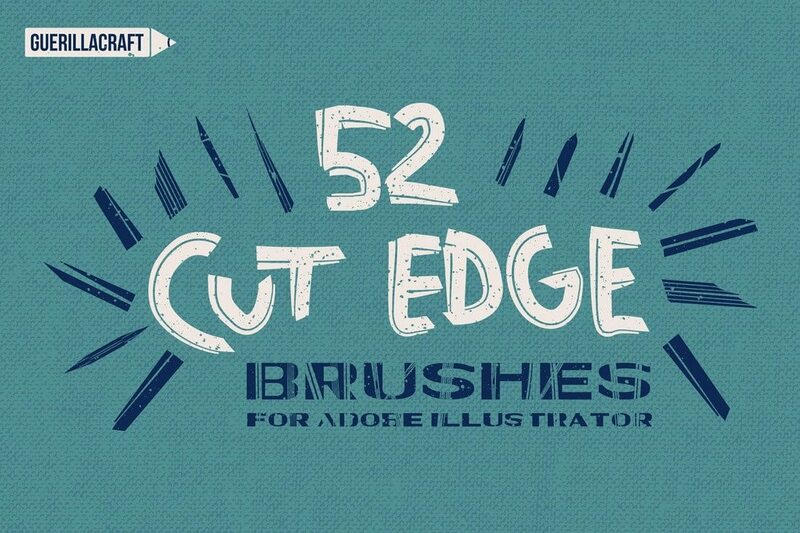 It comes with 52 unique cut edge brushes. This brush set is perfect for adding stylish borders, decorating text, dividers, logos, and much more. 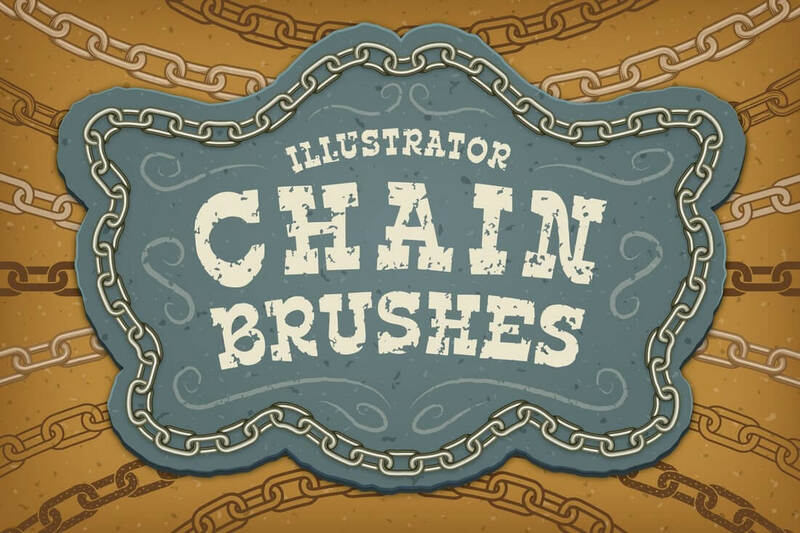 It comes with several unique chain brushes, including chains with metal effect, etched chain, outline, and more. 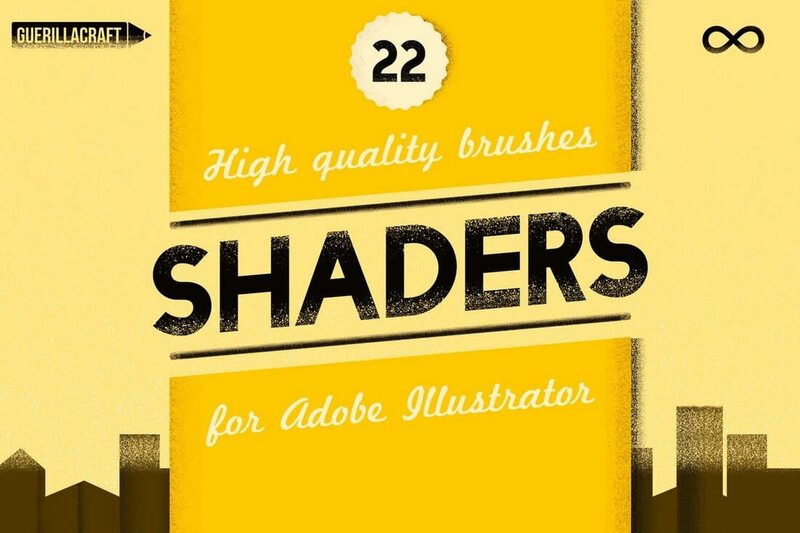 These brushes are designed to help you give your illustrations and designs a vintage look. 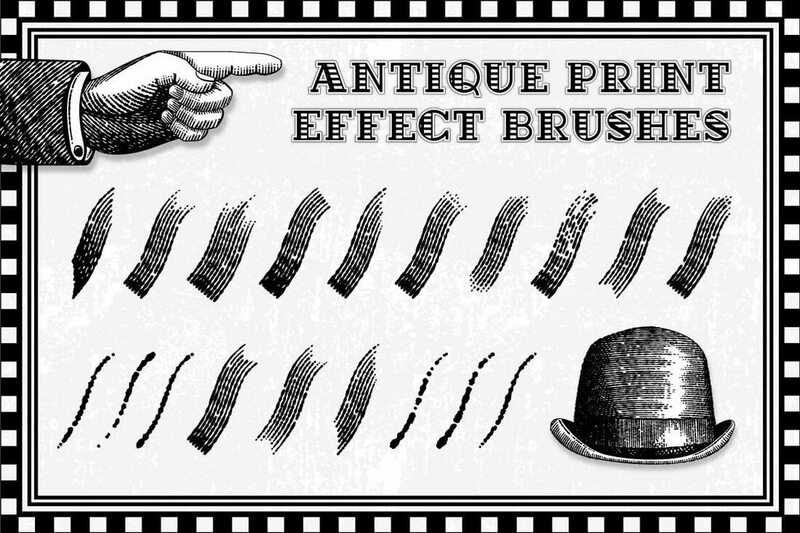 The 32 brushes in this pack will let you achieve that vintage print effect for your designs. This is a unique pack of 42 scribbler brushes that’s been designed inspired by Mid-century illustrations. In addition to the handmade brushes, it also includes 6 scatter brushes. 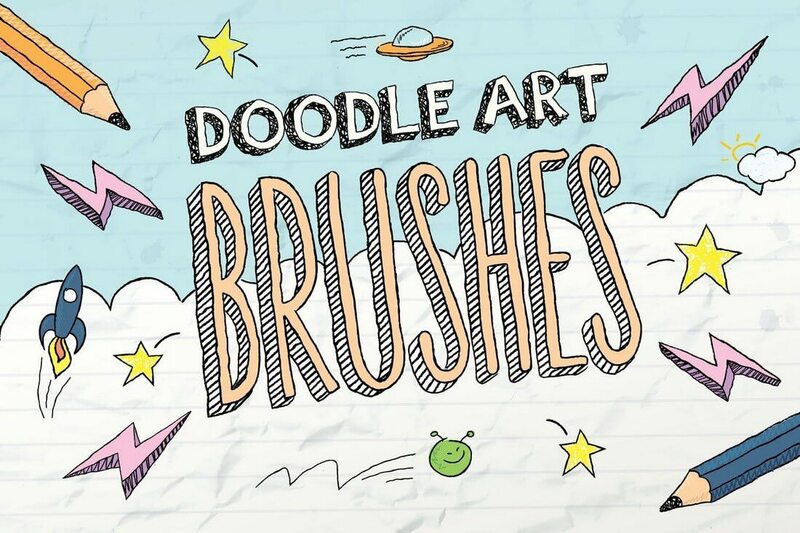 A set of fun and entertaining doodle brushes. Best for crafting all your fun designs, including sketches for kids, illustrations, comics, and more. 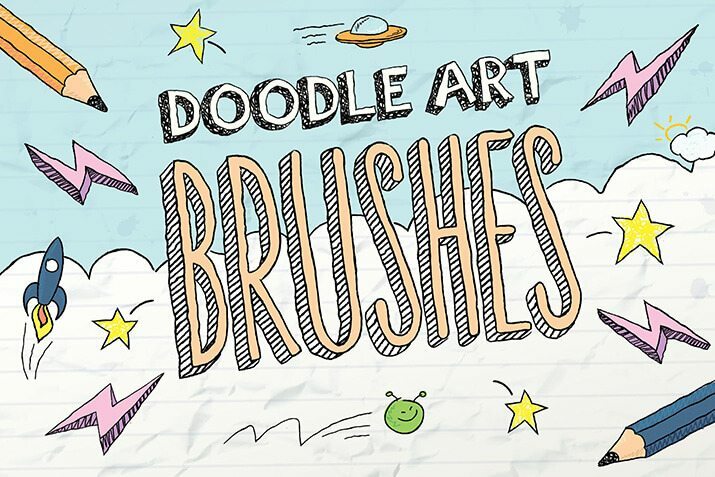 The pack includes 11 zigzag doodle brushes, 11 simple doodle brushes, 23 scribbled doodle brushes, and more. 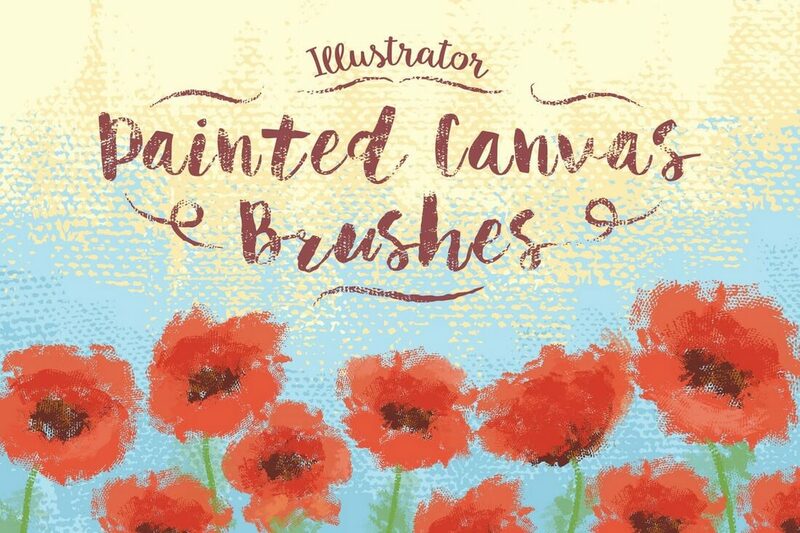 This bundle of 67 painted canvas brushes is designed for adding texture, depth, edge, and decorations for your designs. It features sets of different angled, narrow, messy, and many other painted canvas brushes. A set of handmade brushes featuring various styles for all your texture building design work. The brushes in this pack are easy to use and will fit most types of graphic design, digital art, and illustration works. 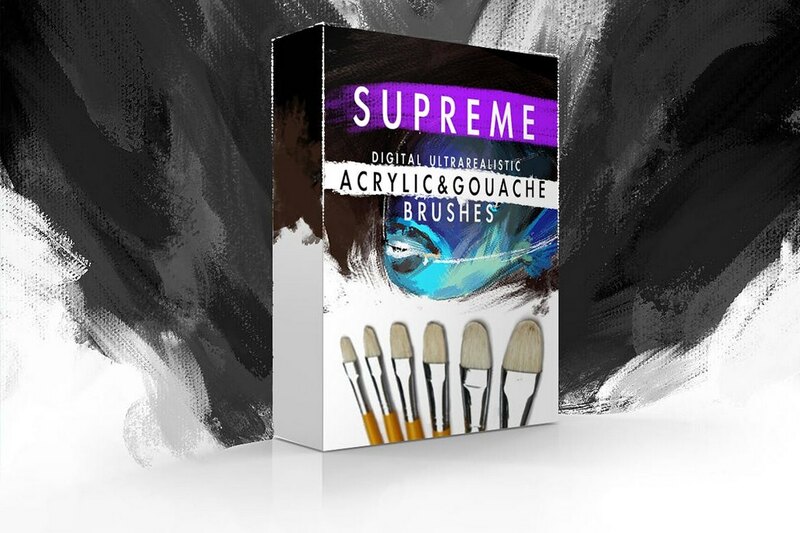 This bundle features 30 spray painted brushes and 17 splatter acrylic brushes. All of which are available in 700px to 2000px high resolutions. They are best for adding special grungy effects to your designs. 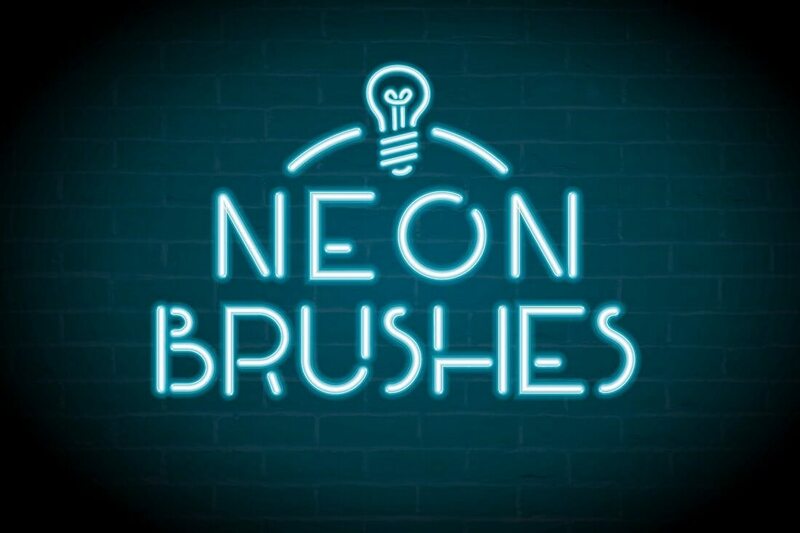 A set of unique brushes that will take neon sign designs to a whole another level. This pack includes over 30 different flexible neon tube brushes. You can use them to design digital art, signage, and more. The high-resolution brushes in this pack come in 2500 x 2500px resolutions. 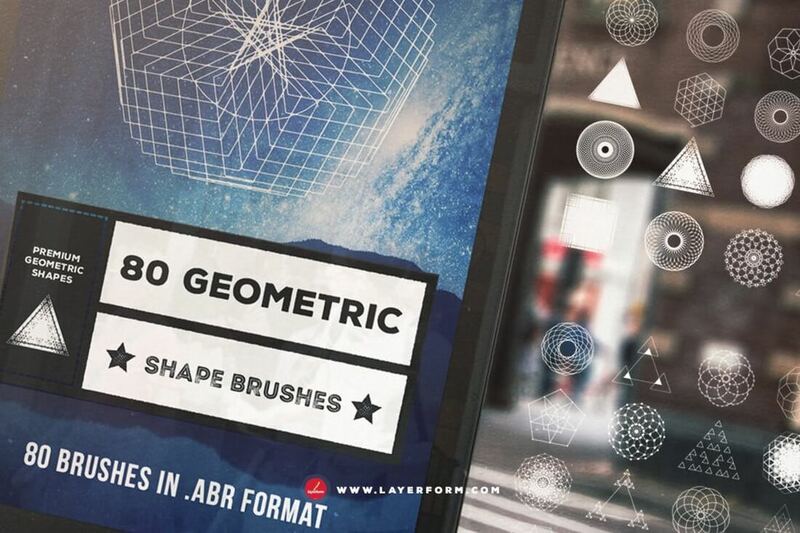 With the collection of 80 unique shapes, you can use this brush pack to design unique art, logos, badges, and more. The brushes in this pack are made just for making texture shades. They can also be used for borders and to add shadows. 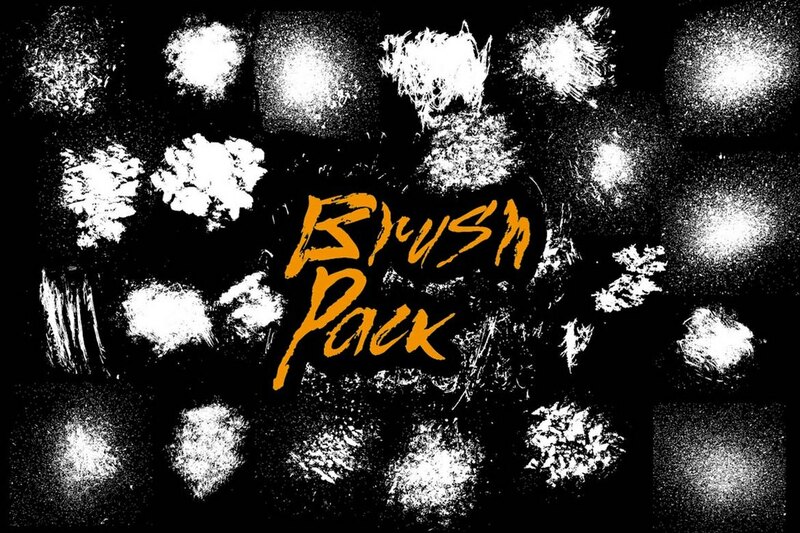 The pack includes 22 unique brushes. 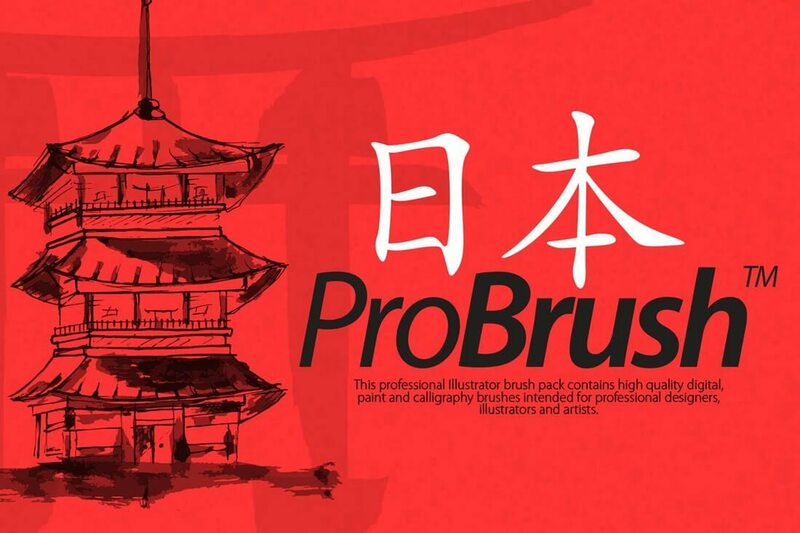 Last, but not least, a massive bundle of 100 Illustrator brushes for all your design needs. This pack includes classic, dry, watercolor, noise, scratched, and many other types of brushes. All in one pack. If you’re new to Photoshop and different kinds of brushes, be sure to check out our beginner’s guide to using scatter brushes in Photoshop and also grab a set of free cloud brushes.